Natalie du Toit ended her swimming career with defeat to Australian Ellie Cole in the S9 100m freestyle final. 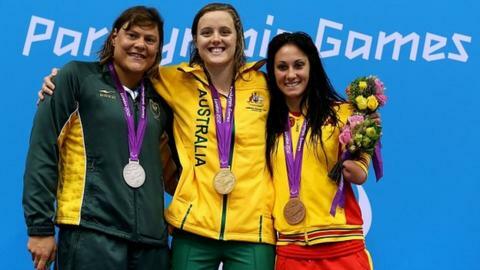 The South African, who says she nearly did not attend the Games after a troubled build-up, ended the event with three golds and a silver. Du Toit, who lost her left leg in a car crash in 2001, won 15 Paralympic medals in all - 13 gold and two silvers. "I walk away knowing I have achieved everything I could ever have wanted to," said the 28-year-old. Great Britain won just one silver medal on day nine, in the women's 4x100m medley relay. The team of Heather Frederiksen, Claire Cashmore, Stephanie Millward and Louise Watkin trailed in fourth with one length remaining but Watkin drove her team onto the podium, although their time of four minutes 53.98 seconds was just three one-hundredths off the Australian winners. "It was very exciting to catch up, Louise did a fantastic job but I would have loved us to get the gold," Millward told BBC 5 live. "It's a real shame to see her finish on a low point really. She did what Oscar Pistorius did in 2012, in 2008, by competing at an Olympic and Paralympic Games. There's no question about whether it's right for her to complete because there is no issue about her classification or her legs and that's massively boosted the credibility of Paralympic swimming around the world. She's been a fantastic ambassador for the sport and for the country and the Paralympic movement generally." Du Toit, who made her Paralympics debut in 2004, has alluded to her pre-Games struggles in post-race interviews throughout this last week, but has been guarded about the true nature of her unhappiness. What is known is that Cathy Doyle, a close friend from the South African swimming authority, passed away following a long-term illness in January. She is also believed to be unhappy with the level of support provided by her national governing body. "I'm not aloud to speak about it at all but it's been very hard over the last 18 months and it's about working hard going out there, trying and not being good enough," du Toit told BBC Sport. "It's sad [it has to end this way], but I've been out there for 22 years and I walk away with no regrets." Du Toit, who also competed in the 10km open water event at the 2008 Olympics, added: "I have barely trained heading into this event but I promised about four or five months ago that I would be here, even though I didn't want to be here and I look back now and I think that I am grateful that I am here. "It's great to see all of the youngsters coming through and my aim was to win a few medals and I think that's something which I can look back on my career and say I'm grateful for." GB's Andrew Mullin (S5 50m butterfly), Hannah Russell (S12 50m freestyle) and Rhiannon Henry (SM13 200m individual medley) all finished fourth in their respective finals. Six-time Paralympic champion Sascha Kindred was disqualified in the S6 50m butterfly final for what is believed to have been an illegal leg-kick, which has occurred in previous events and is linked to his cerebral palsy.